Many TV listening devices can help those of us who are hearing impaired hear the television better. Some of the best products are wireless speakers that act as a hearing aid by transmitting sound from your TV to a speaker that you can place directly beside you. These types of speakers are perfect for people who don’t like to wear headphones and find headset listening systems to be uncomfortable. If you are always turning up the volume of your television to the point that you are bothering other members of your family, you will benefit from a television amplifier speaker system. TV speakers that have voice clarifying software can be a great addition to any household that struggles to find a volume that works well for everyone. They are relatively affordable, and there are many different options to choose from. Power Supply – The TV Ears and the Audio Fox use a power supply of 110v for the speakers, so you plug them into an electrical outlet, without the need to worry about batteries wearing out. The Soundbox speaker uses a lithium rechargeable battery that is built into the receiver that has a battery life of approximately 8 hours. When the battery light indicates that it is running low, you place the receiver back onto the base to charge. Radio Frequency of Infrared– Both Radio Frequency and Infrared systems are a popular choice as a TV hearing aid. They are both are relatively inexpensive, readily available and easy to set up and use. Both types of technology generally come with two parts: a transmitter that you plug into the back of your TV, and a receiver (the speaker) that will send the sound from the television directly to your receiver. Both types of systems can be used with or without a hearing aid. IR systems need to have a line of site (similar to the way a TV remote control works) to operate, so they are slightly limiting. Radio Frequency transmits audio from the television wirelessly via FM waves to the speaker near the listener; the receiver DOES NOT need to be in the same room as the transmitter, so you are free to take the speaker around the house as long as you stay within the product range. Compatibility with your TV – All of the devices that we have recommended should work with any TV brand. You will need to have access to the audio output jacks at the back of the TV. For older sets with no outputs, most systems feature optional microphones that users may place next to the speaker of the TV. If you have a wall mounted television, you may have trouble getting to the back to access the ports, or if you have a complex system set up, you may run into some problems with setup. Range- The TV Ears Speaker and the Soundbox speakers use infrared technology, so they must maintain a line of sight with the transmitter to function. It works in much the same way as a television remote control. This makes the range somewhat limited, but if you are staying in one room and are not planning on moving around, then either of these devices will be fine. 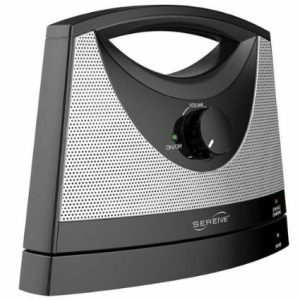 If you are looking for a speaker that does not require line of sight and can work in another room, you can try the Serene Innovations TV Sound Box. Sound Quality– The sound quality for most of these types of speakers is generally pretty good. If you are very particular about the sound, the Soundbox probably has the best sound quality. Since the speakers close to the listener’s ears, the volume doesn’t have to be cranked up causing it to sound unpleasant. Design- TV listening speakers for people with hearing issues all have slightly different designs. Generally, speakers that are designed to amplify the sounds coming from the TV look and feel like any other type of small speaker except for the Audio Fox which has a unique design. The big difference between these types of speakers and regular speakers is that they contain some voice clarifying software, to help make hearing voices from the TV more clearly. Setup-Setup for the most part, the set up for these types of speaker TV listening systems should be pretty straight forward. If you have a complicated television setup, you may run into some difficulties getting the system to work, but generally, you should be able to plug the transmitter easily into the back of your television using the applicable audio port and necessary cables that come with the devices. Once connected you turn on the speaker and you should be ready to watch TV. Ease of Use– None of the listening systems are very complicated to use. There is generally a large knob to adjust the volume, and there may be an option to modify tone on the device. There will also on/off /mute options on the products, so they are quite simple to operate. Warranties- The standard warranty for these types of products is a one-year limited warranty, and 30-day money back guarantee. TV Ears offer an unusually long 5-year limited warranty. The ZVOX AV200 is a fantastic option for those who have trouble understanding voices on the TV. It uses the same kind of technology that hearing aids use to bring forward voice and make them understandable. Reviewers love how well it works, how easy it is to use and the easy setup. It doesn’t work as well as other speakers for listening to music. 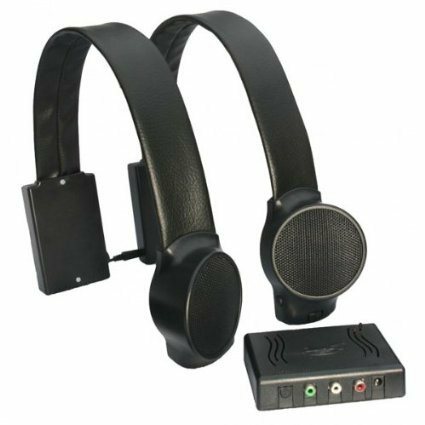 The TV Ears11290 5.0 is easy to operate, wireless speaker that will benefit users who have a hard time hearing television dialogue. 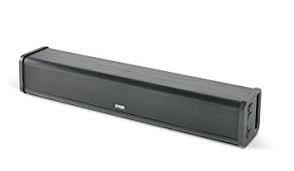 It does an excellent job of raising the sound of voices while lowering the background music for more enjoyable television watching. This unit is especially useful for users who don’t like wearing headphones or earbud (but you can also wear them with this speaker if you choose). It has a sizeable easy-to-use volume dial and has digital connectivity with Dolby, SRS, and PCM compatibility; it also works with any brand of television. Users love that the voice clarifying technology helps them to define voices on the television and reduce the background sound. It is also straightforward to use the device because the large knob is easy to see and manipulate. Overall TV Ears makes it much easier to enjoy programs without bothering family members. The Soundbox is a fantastic option for individuals who want a cordless, rechargeable, portable speaker that they can move from room to room that has a good range and excellent sound quality. 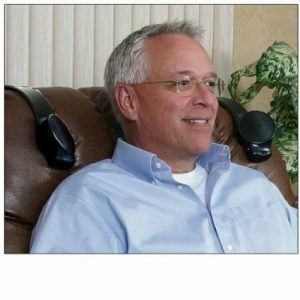 It is a handy product for anyone with hearing loss or family members that are forced to watch television at a level that is not comfortable for them. The Soundbox will help to eliminate some of the background sounds while also clarifying voices. It is also easy to set up and use. 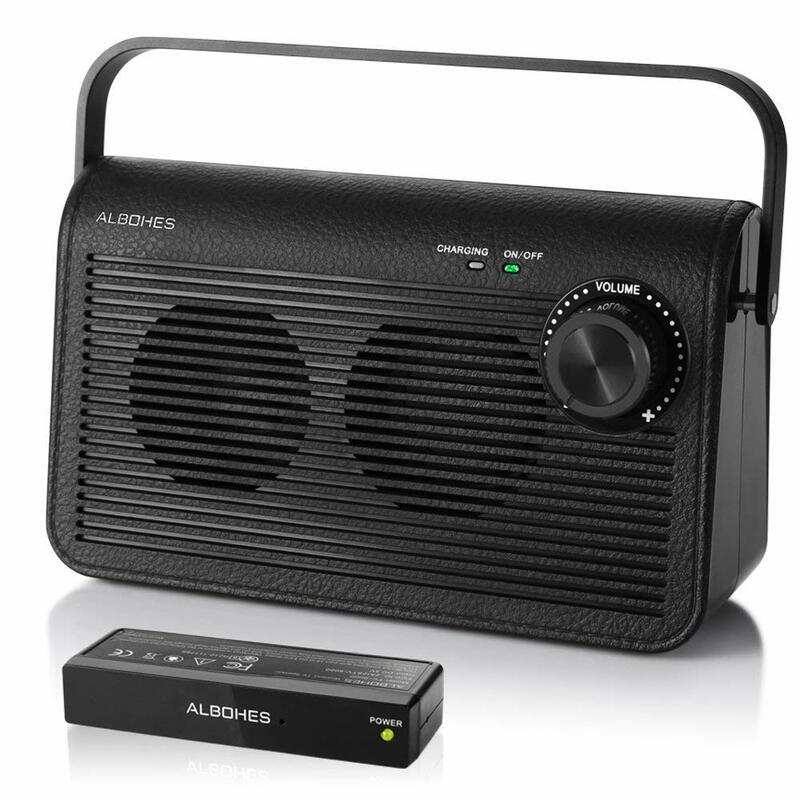 Reviewers love that is it so lightweight and easy to move around, making it the most portable of the TV listening systems. It also has great range so you can take it around your house or even into your back yard and still hear programs or music. It has a headphone jack so you can listen through headphones if that is preferred depending on the situation. Some users may have a problem with the device slipping off the furniture it is attached to. The setup instruction could be improved. The Audio Fox Wireless TV Speakers are a great addition to any household who has a family member with hearing issues who likes to watch television at a high volume. The speakers for this TV watching system attach to the back of your chair, couch, or bed. They are more expensive than some of the other TV listening systems available, but they are well worth it if you don’t like wearing headphones. It does not require line-of-sight like many other products on the market which use infra-red technology. To set it up all you have to do is plug the transmitter into your TV’s audio out port and a 110V power outlet, and then turn on your receiver. It is compatible with any television audio output. Users love the Audio Fox speakers unique design that let the sound from the TV go right to your ears without having to wear headphones that can be uncomfortable for some users. The speakers are also very easy to use, so they can work well for many people who may have trouble using different types of devices. Some users find that the speakers don’t clamp to the chair very well and the manufacturer needs to come up with an alternate attachment method if the chair or couch you are using the speakers on is thinner than the width of the strap or if they are often moved to different locations. Infrared systems use a small transmitter that converts the sound that is coming from your television into invisible infrared light waves transmitted to your receiver (usually a headset ) that turns the light back into high fidelity stereo sound that goes directly into your ears. You can then adjust the sound to your desired volume. You can use this type of system with or without a hearing aid. IR systems plug directly into the audio output of a TV set. Radio Frequency/FM listening systems transmit sound via radio waves that can go through walls and ceilings, so you can keep listening to the television in any room. The personal FM system consists of a transmitter microphone that is attached to the tv and a receiver (the speaker). The receiver transmits the sound directly to your ears or, if you wear a hearing aid, to the hearing aid. The main difference between Infrared and FM systems is that infrared light is unable to pass through walls, so they are particularly useful for situations where you want to move the speaker to another room or outside. There are many options to help hear the TV better and make watching a more pleasant experience for everyone in the family. Wireless TV speakers that can act as a hearing aid for television watching are a great product to invest in, not only are they relatively inexpensive, they are also easy to set up and to use. If you find watching TV as a person who has hearing loss or as someone who lives with an individual who has hearing loss these types of speakers are highly recommended.